December 16, 2015 by stas | Filed under General. Mark Twain invented an infallible scheme for anyone to get hired. He describes his scheme and how he got three men to get a job using this scheme in the following text. The approach worked more than 100 years ago and chances are that it’ll still work just the same today as human nature hasn’t really changed that much in such a “short” period of time. Higbie was the first person to profit by my great and infallible scheme for finding work for the unemployed. I have tried that scheme, now and then, for forty-four years. So far as I am aware it has always succeeded, and it is one of my high prides that I invented it, and that in basing it upon what I conceived to be a fact of human nature I estimated that fact of human nature accurately. Higbie and I were living in a cotton-domestic lean-to at the base of a mountain. It was very cramped quarters, with barely room for us and the stove—wretched quarters indeed, for every now and then, between eight in the morning and eight in the evening, the thermometer would make an excursion of fifty degrees. We had a silver-mining claim under the edge of a hill half a mile away, in partnership with Bob Howland and Horatio Phillips, and we used to go there every morning carrying with us our luncheon, and remain all day picking and blasting in our shaft, hoping, despairing, hoping again, and gradually but surely running out of funds. At last, when we were clear out and still had struck nothing, we saw that we must find some other way of earning a living. I secured a place in a near-by quartz mill to screen sand with a long-handled shovel. I hate a long-handled shovel. I never could learn to swing it properly. As often as any other way the sand didn’t reach the screen at all, but went over my head and down my back, inside of my clothes. It was the most detestable work I have ever engaged in, but it paid ten dollars a week and board—and the board was worth while, because it consisted not only of bacon, beans, coffee, bread and molasses, but we had stewed dried apples every day in the week just the same as if it were Sunday. But this palatial life, this gross and luxurious life, had to come to an end, and there were two sufficient reasons for it. On my side, I could not endure the heavy labor; and on the Company’s side, they did not feel justified in paying me to shovel sand down my back; so I was discharged just at the moment that I was going to resign. I was pretty anxious to know what was going to happen—more anxious than I would have wanted him to find out. I preferred to seem entirely confident of the strength of my scheme, and I made good show of that confidence. But really I was very anxious. Yet I believed that I knew enough of human nature to know that a man like Higbie would not be flung out of that place without reflection when he was offering those muscles of his for nothing. The hours dragged along and he didn’t return. I began to feel better and better. I began to accumulate confidence. At sundown he did at last arrive and I had the joy of knowing that my invention had been a fine inspiration and was successful. He said the foreman was so astonished at first that he didn’t know how to take hold of the proposition, but that he soon recovered and was evidently very glad that he was able to accommodate Higbie and furnish him the refreshment he was pining for. It turned out just so—and after that I led an easy life, with nothing to do, for it did not occur to me to take my own medicine. I didn’t want a job as long as Higbie had one. One was enough for so small a family—and so during many succeeding weeks I was a gentleman of leisure, with books and newspapers to read and stewed dried apples every day for dinner the same as Sunday, and I wanted no better career than this in this life. Higbie supported me handsomely, never once complained of it, never once suggested that I go out and try for a job at no wages and keep myself. I have never seen Higbie since, in all these forty-four years. Shortly after my marriage, in 1870, 1870 I received a letter from a young man in St. Louis who was possibly a distant relative of mine—I don’t remember now about that—but his letter said that he was anxious and ambitious to become a journalist—and would I send him a letter of introduction to some St. Louis newspaper and make an effort to get him a place as a reporter? It was the first time I had had an opportunity to make a new trial of my great scheme. I wrote him and said I would get him a place on any newspaper in St. Louis; he could choose the one he preferred, but he must promise me to faithfully follow out the instructions which I should give him. He replied that he would follow out those instructions to the letter and with enthusiasm. His letter was overflowing with gratitude—premature gratitude. He asked for the instructions. I sent them. I said he must not use a letter of introduction from me or from any one else. He must go to the newspaper of his choice and say that he was idle, and weary of being idle, and wanted work—that he was pining for work, longing for work—that he didn’t care for wages, didn’t want wages, but would support himself—he wanted work, nothing but work, and not work of a particular kind, but any kind of work they would give him to do. He would sweep out the editorial rooms; he would keep the ink-stands full, and the mucilage bottles, he would run errands, he would make himself useful in every way he could. I suspected that my scheme would not work with everybody—that some people would scorn to labor for nothing, and would think it matter for self-contempt; also that many persons would think me a fool to suggest such a project; also that many persons would not have character enough to go into the scheme in a determined way and test it. I was interested to know what kind of a candidate this one was, but of course I had to wait some time to find out. I had told him he must never ask for wages; he must never be beguiled into making that mistake; that sooner or later an offer of wages would come from somewhere, and in that case he must go straight to his employer and give him the opportunity to offer him the like wages, in which case he must stay where he was—that as long as he was in anybody’s employ he must never ask for an advance of wages; that would always come from somewhere else if he proved his worthiness. The scheme worked again. That young fellow chose his paper, and during the first few days he did the sweeping out and other humble work; and kept his mouth shut. After that the staff began to take notice of him. They saw that they could employ him in lots of ways that saved time and effort for them at no expense. They found that he was alert and willing. They began presently to widen his usefulness. Then he ventured to risk another detail of my instructions; I had told him not to be in a hurry about it, but to make his popularity secure first. He took up that detail now. When he was on his road between office and home, and when he was out on errands, he kept his eyes open and whenever he saw anything that could be useful in the local columns he wrote it out, then went over it and abolished adjectives, went over it again and extinguished other surplusages, and finally when he got it boiled down to the plain facts with the ruffles and other embroideries all gone, he laid it on the city editor’s desk. He scored several successes, and saw his stuff go into the paper unpruned. Presently the city editor when short of help sent him out on an assignment. He did his best with it, and with good results. This happened with more and more frequency. It brought him into contact with all the reporters of all the newspapers. He made friends with them and presently one of them told him of a berth that was vacant, and that he could get it and the wages too. He said he must see his own employers first about it. In strict accordance with my instructions he carried the offer to his own employers, and the thing happened which was to be expected. They said they could pay that wage as well as any other newspaper—stay where he was. This young man wrote me two or three times a year and he always had something freshly encouraging to report about my scheme. Now and then he would be offered a raise by another newspaper. He carried the news to his own paper; his own paper stood the raise every time and he remained there. Finally he got an offer which his employers could not meet and then they parted. This offer was a salary of three thousand a year, to be managing editor on a daily in a Southern city of considerable importance, and it was a large wage for that day and region. He held that post three years. After that I never heard of him any more. 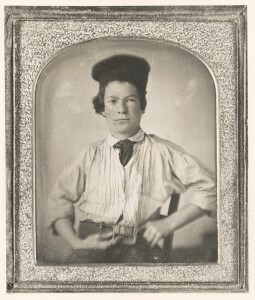 About 1886 my nephew, Samuel E. Moffett, a youth in the twenties, lost his inherited property and found himself obliged to hunt for something to do by way of making a living. He was an extraordinary young fellow in several ways. A nervous malady had early unfitted him for attending school in any regular way, and he had come up without a school education—but this was no great harm for him, for he had a prodigious memory and a powerful thirst for knowledge. At twelve years he had picked up, through reading and listening, a large and varied treasury of knowledge, and I remember one exhibition of it which was very offensive to me. He was visiting in our house and I was trying to build a game out of historical facts drawn from all the ages. I had put in a good deal of labor on this game, and it was hard labor, for the facts were not in my head. I had to dig them painfully out of the books. The boy looked over my work, found that my facts were not accurate and the game, as it stood, not usable. Then he sat down and built the whole game out of his memory. To me it was a wonderful performance, and I was deeply offended. As I have said, he wrote me from San Francisco in his early twenties, and said he wanted to become a journalist, and would I send him some letters of introduction to the newspaper editors of that city? I wrote back and put him strictly under those same old instructions. I sent him no letter of introduction and forbade him to use one furnished by anybody else. He followed the instructions strictly. He went to work in the Examiner, a property of William R. Hearst. He cleaned out the editorial rooms and carried on the customary drudgeries required by my scheme. In a little while he was on the editorial staff at a good salary. After two or three years the salary was raised to a very good figure indeed. After another year or two he handed in his resignation—for in the meantime he had married and was living in Oakland, or one of those suburbs, and did not like the travel to and fro between the newspaper and his home in the late hours of the night and the morning. Then he was told to stay in Oakland, write his editorials there and send them over, and the large salary was continued. By and by he was brought to New York to serve on Mr. Hearst’s New York paper, and when he finally resigned from that employment he had been in Mr. Hearst’s employ sixteen years without a break. Then he became an editorial writer on the New York World with the privilege of living out of town and sending his matter in. His wage was eight thousand dollars a year. A couple of years ago Collier’s Weekly offered him an easy berth and one which was particularly desirable in his case, since it would deal mainly with historical matters, past and present—and that was an industry which he liked. The salary was to be ten thousand dollars. He came to me for advice, and I told him to accept, which he did. When Mr. Pulitzer found that he was gone from the World he was not pleased with his managing editor for letting him go, but his managing editor was not to blame. He didn’t know that Moffett was going until he received his resignation. Pulitzer offered Moffett a billet for twenty years, this term to be secured in such a way that it could not be endangered by Pulitzer’s death, and to this offer was added the extraordinary proposition that Moffett could name his own salary. But of course Moffett remains with Collier, his agreement with Collier’s having been already arrived at satisfactorily to both parties. Written by Mark Twain on Tuesday, March 27, 1906 in Autobiography of Mark Twain Vol 1. pages 447-451. The amazing Autobiography of Mark Twain was published 100 years after his death. Samuel Langhorne Clemens (aka Mark Twain) willed that – so that he could write freely and without censorship to make sure his words won’t “hurt” anybody alive with his honest and direct account of the matters at hand. This unusual unconstrained style of delivery for that era makes it a very delightful read. The full text is also available freely at marktwainproject.org. If you have used this strategy or know someone who did please share with the rest of the readers. Thank you.